For a year and a half we ran an Early Access Program (EAP) for this product while it was still known as 0xDBE. At some point one needs to stop and draw the line. We thank all of you who gave us feedback and we’re looking forward to your help with the following versions. So please welcome DataGrip 1.0, our IDE for databases and SQL! DataGrip provides a UI for operations like creating/modifying tables and managing their columns, keys and indices. Execute generated code at once, or open it in the text editor and continue to work with the DDL script directly. With DataGrip you can write code faster by making use of code completion. Just start typing the name of a database object, identifier or variable to get a list of matching suggestions. DataGrip is aware of dependencies for completing JOIN clauses, can suggest types of parameters for functions and procedures, and describe table structure for INSERT statements. There are Live Templates for generating conventional parts of statements – use the default ones and create new ones as well. DataGrip resolves object references in SQL files. If you rename a variable or alias, they will be renamed throughout the code. If you rename database objects from SQL, they will also be renamed in the actual database. The IDE shows usages of objects (table, column, etc.) or variables in dedicated views. Navigation tools help you select an object in various contexts like the editor, schema view, and others. Powerful table editor lets you add, remove, edit, and clone data rows. Use the filter text field to see only the data you need, without writing WHERE clauses. The other way to find what you need is the text search. It’s helpful if you don’t know which exact column contains the data you’re looking for. Regular expressions are available in the text search. Navigate through the data by foreign keys—you can go to the data your row is referring to and vice versa. Choose what you want DataGrip to do when the Execute button is clicked—execute the subquery, execute the outer query, or execute the whole script. Do you want a particular part of code to be executed? Just select it and run. Execution plan is provided. Result-set is similar to the table editor with the same options available including adding/deleting rows, text search, and data navigation. Compare two result-sets in diff viewer. Version control systems integration: Git, Subversion, etc. Plugin ecosystem: Terminal, Textmate bundles, etc. See DataGrip features page for CSV editor, diagrams, parameterized queries and more. Is DataGrip available via JetBrains ToolBox as part of the “All Products” pack? Yes, it is available both as a Single IDE and as part of “All Products.” If you already have “All Products,” you can already use DataGrip. Does DataGrip repeat the functionality of the database tools in other JetBrains IDEs? Yes, the first version focuses on that core functionality. Can I use DataGrip with SQL dialects that are not listed? Yes, JDBC driver is the only requirement. Are stored code debugging, administration tools and NoSQL features planned? Yes, we’re going to add this functionality in future versions. Can I suggest a feature or communicate my feedback? Yes! Please talk to us via the feedback form, issue tracker, community forums, and Twitter. This entry was posted in Releases and tagged 1.0, basics. Bookmark the permalink. I just wanted to add that even though there are some issues I still think 0xDBE is currently the best tool out there! Thank you for your feedback, Rymson! Since you are one of the most active EAPers and, in fact, our advocate, we plan to give you a one year licence for DataGrip for free. This repeats the functionality in Intellij, but does it add any more features over and above Intellij? If they are equal right now, will that always be the case? Would be nice to see a feature comparison chart. The latest version of IntelliJ IDEA Ultimate includes the functionality of DataGrip 1.0. Still, DataGrip is focused on working with databases and SQL and thus may provide better user experience as a standalone IDE. How large the databases can this tool handle? I’ve got a DB with hundreds of tables, with hundreds of fields inside of each table, many thousands of views, sprocs, functions. Many third-party tools just choke on this monster, only SSMS barely handles it. Can your tool handle large set of objects? Hi! We can handle this kind of databases. So, please download a trial and make sure of it. If there would be some troubles we are always glad to help. ah, nevermind. Can’t even connect to local sqlexpress instance. Why? What is the problem? I get “Unable to connect to the instance because there possibly network issue blah-blah…”. But instance is online, TCP/IP connectivity is enabled and I can access it through SSMS. Possibly issue with SQL Server 2008RC2 – quite dated now, but suspect the jdbc drivers are crap – I’ve spent hours fighting them trying to get TeamCity to work on SQL Server. Drop me an email to trailmax1@gmail.com if need more info for debugging. Hi! Can you please provide a screenshot of connection window? Very often case is when the port number points to the other place than an instance name, and port number has a priority. If you still have problems, let’s continue via email. Is it possible to connect with JDTS driver? Sorry, missed this message. I don’t get notifications for some reason. Now I’m trying to connect to SQL Server 2012 with Windows Authentication – just the same as with 2008R2. 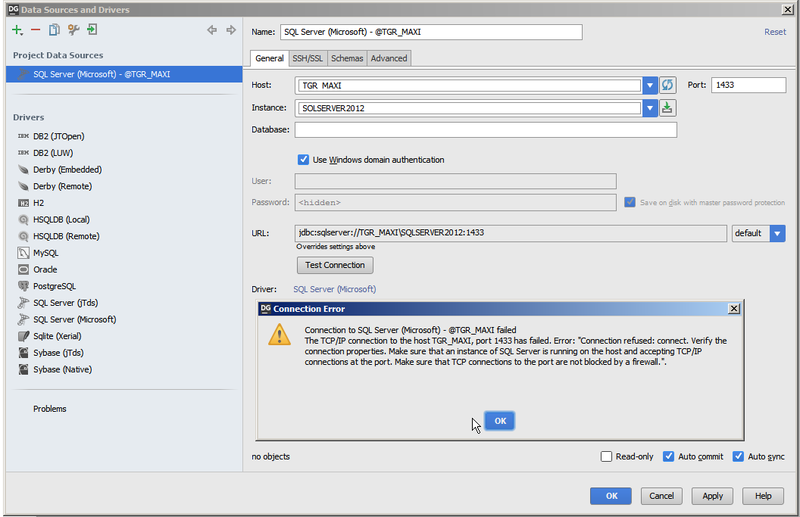 I have TCP/IP connections enabled on both instances (2008R2 and 2012) and SQL Server Browser has always been turned on – as Anton suggested below. I’m not a developer of this program, but faced with the same problem. Max, let’s try the following at first: just remove the port number and try to connect. Removing the port and only specifying the host and instance worked for me. Problably, your problem is firewall blocking the port that you are using. Try to desativate firewall just for test. This sounds great. What I need it to be is a competitor to Sql Server Data Tools. It should let me write only the create table statement (or stored proc etc) and automatically diff with a deployed database. From that it needs to generate an update script that I can use on that database. If this is not already there can we get a youtrack request for this and +1 it? Obviously it must have version control and the smart suggestions we’ve come to expect from JetBrains. DataGrip can compare schemas and generate diff scripts. And we support Version Control as well. – There’s no editing in the result grid when you execute a statement from a table with the ROWID attribute (like Toad does). It’s pretty useful. – The XMLTYPE editing doesn’t seem to work well, I get an  ORA-01461 error. – The PL/SQL packages are not parsed correctly, almost everything is in red. – Very easy to configure, I got my three connections working in 5 minutes. – The autocomplete works great. Will thee be some community version or student license? I have used it a lot with postgres, I have got quite used to it. There is no community version but you can always get a free license as a student. I have been using 0xDBe for a long time now and they even implemented DB2 on iSeries when I posted it (They were currently only supporting DB2 on Linux) Anyhow I really love using this product! Surely, we shall start from most popular NoSQL dbs, but for now there are not particular plans. Also looking for something like this. Can you import and export excel sheets? Map columns on import? We have no import excel sheets. What about exporting, there is an export to CSV and if the tab is a separator, excel will open this kind of file. I was showing data grip to our database guy at work and this is the first feature he asked for. There are many times when someone will hand him an excel sheet and he needs to import it into our database. Half the time the columns don’t line up exactly so being able to map them on import is a must. Exporting is not a likely as high as a priority, but I’m sure it would save time being able to hand someone an excel sheet back instead of having to do the manual conversion first. He currently uses SQL Studio with SQL Server, but we’re thinking of migrating to Postgres and looking at alternative software. I use Intellij Idea so this is why I had him try out Data Grip. Seems I’m way to thick to use this product. While SQL Management Studio opens and connects without problems, I’ve not found the magic words that allow me to connect to my local SQL Express instance using DataGrip. I did manage to get at a SQLite database though, so there is hope for me yet! Guess I just wait for a FAQ or some kind person to post clues on stackoverflow. Hi, Steven! Can you please provide a screenshot of connection window? Hello, Billy! If you downloaded the latest version of DataGrip from our site, then may be you can try the installer with no JDK bundles and tell us if there is a success. I’ve been using the 0xDBE since Dec 2014, alongside Intellij to connect to my hadoop clusters. Its been great. Curious if datagrip will be treated similar to PyCharm, where most of functions will be available as a plugin for Intellij? IntelliJ IDEA has all DataGrip functionallity. Any plan for supporting nosql such as MongoDB? Far plan, but not in closest releases. For now we do not plan to implement it as a VS extension. Ok, gave it a go. * Database exploring capability is there. It is unclear though as to when and how these become available. After the schemas were manually set?. So if there is an issue – there is no indication of it. Don, thank you for the feedback. Useful and we shall think, thanks! For all features you can create tickets in issue tracker and people will vote for them. I’m trying to upgrade from 0xDBE to DataGrip, but it can’t find my 0xDBE settings. Known problem or just me? Hi! Sorry, but a known one. Was hoping that you would create a DB client as the existing ones are average, so it’s a nice surprise to see this released. PHPSTORM smashed existing PHP IDEs out of the park so hopefully this will do the same. I guess an alternative is to make the connection read-only. Hey there, we are using DB2 on iseries/ibmi/as400/systemi (so many names) and we make extensive use of stored procedures. It seems there is difficulty in calling a sproc that has an out parameter. 2015-12-23 19:38:09] [-469] [SQL0469] IN, OUT, or INOUT not valid for parameter 5 in procedure API_MY_SPROC_V1_0 in *N.
Thanks Brandon for the feedback. We know about this inconvenient thing, but for now we cannot say if we will create something in the close future. Maksim, got the same problem. Hi, I got a trouble while adding a new data source. there should be more databases in “Data Sources and Drivers/Schemas” tab but I cannot find them. Only if I declared the database could I can see the database not displayed before. It’s an old SQL Server. Hi! Can you please provide the screenshot? It does not support stored procedures? Hi! It does. What do you mean with “support”? I did manage to get at a SQLite database though, so there is hope for me yet! Where is this information? Hello! What information do you mean? Is there a way to view all the databases on the server? It seems like I can only see one database for each connection I establish. I would like an overall view of all the databases. Hello! Do you use MS SQL? Try looking on Schemas tab in data source properties. Hello, This is exactly what i was looking for. My only feature request here would be a select all button. At my company we have 50ish db’s on a MS Sql Server and I have to constantly switch to different ones based on the client I’m working for at that moment in time. So it would be nice to just say select all the Schema’s so I don’t have to manually go threw and select them. But it will become very slow in this case, won’t it? We are actually working on this, hope to have it in the EAP. quick ask: Does it support PL\SQL? Because i didn’t see any of it on the documentation. How can I view the triggers of a table? What DBMS do you use? I am using Mysql with datagrip and dont see any kind of trigger viewing or manipulation. The closest i can is to execute a SHOW TRIGGERS command. For now there is no possibilities to edit a source code, but we are working on it — we understand it is strongly needed. Altering tables means pain. Too many steps for editing column, no way to change columns order – even if there is some, I gave up looking for it. Arrows is always grey, drag-n-drop displays line where to place column, but then do nothing. So I do it by raw SQL -> No profit from IDE. There is no Excel export. And don’t say about CSV, my clients use only Excel, and when it comes to transformation of CSV file encoding with cyrillic text from UTF-8 to what-ever-mac-excel-can-read – it’s pain and time loses. Hi! Do you have MySQL? If yes, we supported reordering columns from UI (these arrows won’t be grey :) expect it in 1.1. I use webstorm, whats the best way to get this to fit in? The best way is to buy PHPStorm. There is not DB features in WebStorm. Hey ! I’m not an expert in database management, but I have to admit I’m quite lost with this tool. I’m working on an oracle database, and I’m struggling to find functionalities for triggers or packages. Basically, I can’t see my triggers, nor add packages. I actually find it more instinctive and complete to use the database integration provided by the plug-in “DB Navigator”. I suppose most of the functionalities that I can’t find are available, but he difficulty of finding it makes it kind of unusable. The autocomplete is very efficient though, but I wouldn’t buy and IDE just to use it as an SQL editor. I absolutely loved all the JetBrains’ product I used, but this one feels like a beta version. I use the All Products Pack though, so I’ll follow the evolutions. Also, Importing my settings from PHPStorm completely fucked up the keymap, erasing most of the shortcuts. The same thing worked perfectly from PHPStorm to PyCharm and IntellijIDEA. I just downloaded the latest trail version on a Mac (10.11.3). It refuses to accept my Active Directory credentials when connecting to a Microsoft SQL 2012 R2 server. I tried to enter it in several ways (ex: domain/username). This looks like a promising product for my team but I need to get this working first. Does your server have TCP enabled? You cannot export directly to Excel, but you can export to CSV which can be opened from Excel. My DataGrip became super super slow since two weeks ago. Even typing a query in console can be frozen several time. When i’m working in DataGrip Most time it can consume up to 200% CPU and 1.5 GB memory. I’m using MAC Pro with 2.6 GHz Core i7, 16 GB DDR3 and SSD. I would like to attach some screenshots from Activity Monitor but I’m not able to. or wait for the official release. I have trouble to dump data as sql insert regarding timestamps. For example when I execute my sql insert script on MSSQL server I get a conversion error converting a varchar to a timestamp. Is there a possibility to create a dump with correct timestamp formatting? Can you please give an example? Is is possible to import/export whole database through DataGrip? And if, how? Hello! It is not possible for now. Do you mean using it in PostgreSQL? [S0001] Cannot insert an explicit value into a timestamp column. Use INSERT with a column list to exclude the timestamp column, or insert a DEFAULT into the timestamp column. As we explored, it is working as intented due to SQL Server behaviour. I’ve been using Querious for 3 months and it suits me well, but i like intellij products and i wanted to test Datagrip. Do you use 2016.1 of DataGrip? The code complete is great, I can write long SQL expressions really quickly now. After a few weeks of testing, the only issue that has me jumping back to dbVisualizer is that I can’t edit “cells” sometimes. Sometimes I can, sometimes I can’t. It’s not a data issue, I can’t even set them to null sometimes. I enter the value, it spins and thinks for a split second, then tells my “0 rows updated”. The table has a primary key id field and dbVisualizer can figure out how to update the value. Sometimes I can literally just try over and over and it will eventually work. We have a multi tenant environment where all our customers (> 2k) have their own DB with the same schema. Is there a facility to execute an SQL command on multiple databases (on the same server) at the same time? Ideally I would like a way to filter which databases to execute the command against. I don’t wanna sound entitled, but here we go. I was a beta tester for 0xDBE and filed a few bug reports, with screenshots and stack traces and everything. Hello! We sent free licenses for those who report bugs during 0xDBE period, yes. AS far as I remember we sent them to those who reported more than 6 bugs. Was it true for you? this tool seems good. Can I use this for my website to fetch the customers data?